ntsocialism. : Risque driving in Bangalore. 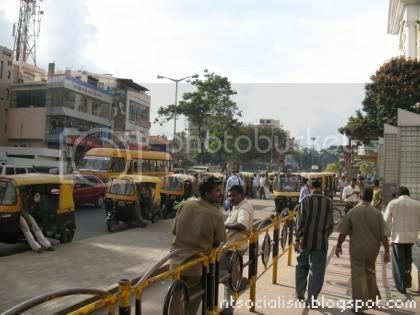 Perhaps I wasn’t prepped in such a way that I wouldn’t be baffled by the amount of odd driving habits practiced by the locals in Bangalore such as the incessant honking evident amongst auto-rickshaws, cab drivers, motorcyclists, truck drivers and private vehicle owners. I thought I’ve seen it all, coming from Malaysia, a country that’s prone to road accidents regardless of season. A Bangalorean cab in the city square. 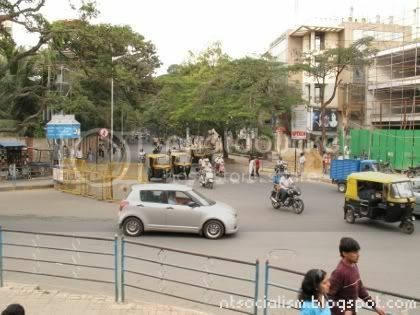 There is adequate evidence to support the notion that driving in Bangalore can factor in fear into one’s blood pressure. Yes, it even supersedes the reckless driving one may experience in other Asian cities and maybe New York City or Paris. To top that up is the obviously poor air quality Bangalore citizens have to endure daily. If you’re unlucky, chances are that anytime after noon in Bangalore is peak hour with hordes of speeding auto-rickshaws and truck drivers buzzing through the dusty streets of Bangalore with such haste and generating an overdose of noise. You’d think twice of being a pedestrian here. Strangely though, there are also incidences whereby unlike other Asian countries, drivers don’t take it personally when honked at. 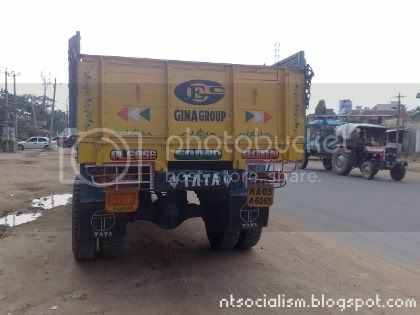 They even sport ‘Sound Horn No Problem’ or ‘Sound Horn OK!’ motif on rear-end of their vehicles. To what extent is their tolerance remains a mystery though. When stuck in a traffic jam, the cab drivers and auto-rickshaws go through a series of meticulous and daredevil manoeuvring, often cheating death at every corner and main junction. With streets so crowded you wonder where they learnt how to drive. In the rural areas maybe? This driving culture is so widespread that it doesn’t matter where you learnt how to drive because it still poses as a risk when you’re out in the streets. Most places in Bangalore have dark unlit roads so everyone drives with their hi-lights on which makes it even harder to navigate and take notice of the stray dogs scared for their lives in the road curve. Generally, cab drivers tend to multi-task a lot as well. They fumble through their pockets for a cigarette or nonchalantly speak on their cell phone for numerous times (they argue that they’re actually ‘networking’). And guess what? 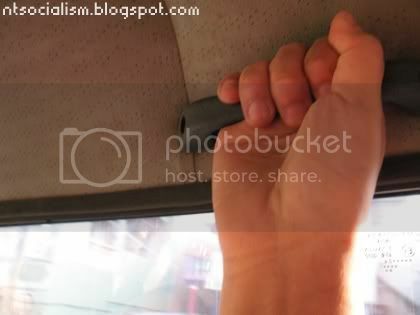 Occasionally, you may end up in a cab that doesn’t have seat belts for both driver and passenger too! Now for the informative bit. Cab drivers, from a foreigner’s experience, charge approximately 850 rupees for a city excursion. The drivers will linger around and remain under your service until he takes you home. At the end of the day, it is 850 rupees for an 8 hour shift with you or more depending on how far you’ve gone beyond the city limits. For long distance trips, the rate may hike up to 1200-1500 rupees depending on destination, type of vehicle (cab agencies have 4x4s too) and hours of usage. 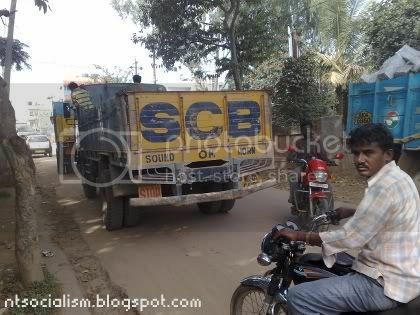 Auto-rickshaws are a cheaper means of tranport but just as risky! 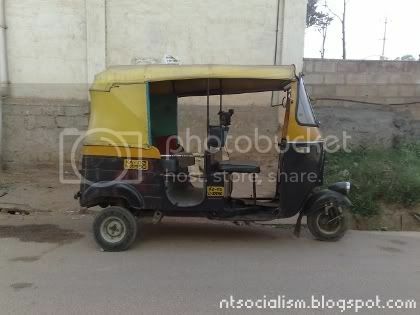 Auto-rickshaws are generally the preferred means of transport if you’re sort of restrained budget-wise. From where I am staying (approximately 20 km away from the city), hiring these riders would cost me 180-200 rupees for a one-way trip to the city centre IF it is a favourable drop-off point (i.e: shopping mall). So, it would be safe to summarise that 1 km on an auto-rickshaw is equivalent to 12 rupees. For short distance trips from within a particular village, it is customary to offer around 30-40 rupees for a one-way trip to anywhere within the area.